Zion National Park is located in the southwestern corner of Utah, not far from the Arizona and Nevada state lines. Southern Utah is home to many beautiful national parks; all of them offer incredible scenery and all of them are worth the visit. But the most impressive of them all is Zion National Park which covers 230 square miles of dramatic landscape of sculptured canyons and soaring cliffs. There is so much to see in Zion that entire books can be written about it (and probably already have). Most people who come here visit Zion Canyon a scenic gorge carved by the Virgin River. Red sandstone cliffs tower above the canyon floor, some of them more than 2,000 feet above the river. 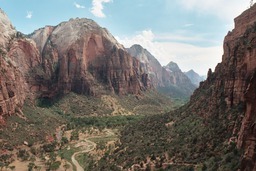 Kolob Canyon is another popular place to see, with several hiking trails. There are so many walks, hikes, and climbs in this park, ranging from easy to very strenuous. I believe that is what Zion is all about. From April through October, you will need to park at the entrance and then take the shuttle bus which was introduced in an attempt to deal with the growing traffic. Zion National Park has some of the most amazing scenery of any place in the United States but the problem is that far too many people heard about it. The crowds can be pretty big in the summer months but like all national parks it's easy to get away from the crowds as soon as you go on a hike on one of the unpaved trails. Summers can be very hot. It's common that the temperature goes over 100 degrees (37 Celsius). The good part is that is dry heat and that it cools off in the evening. Always carry water while hiking. Summer also sees a lot of thunderstorms. We visited in August and there was a storm every evening. We spent three full days at Zion and it wasn't enough. I plan to return one day to hike the famous "Narrows" trail. The scenery is like nowhere else and no matter if you drive or explore the backcountry you will simply be overwhelmed by the amount of scenic beauty in the park.